Thank you for all those people who have supported me in purchasing VCDHelp.com Demo VCDs. 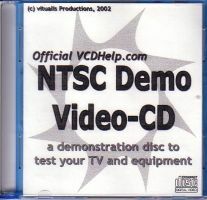 However, as VCD authoring is no longer the main thrust of development (rather DVD authoring) and it is no longer profitable for me to offer these discs for sale, from this date, the Official VCDHelp.com Demo VCDs will no longer be produced. GNU VCDImager Tools GUI updated to v1.1.207! Now includes lkVCDxRIP! Click here for more info. The Official VCDHelp.com PAL/NTSC Demo VCD has been released! It's a VCD on an 8-cm disc that's full of of useful tools/tests and other goodies! You can buy it now for $US 10 + $US 5 (p&h) shipping internationally! If you find the guides useful or use VCDImager Tools GUI, then please donate! Any token of you appreciation helps me to continue writing and updating the guides as well as the program. Thanks! GNU VCDImager is an open source project aimed at the development of tools to author "Video CDs" (VCDs) and "Super Video CDs" (SVCDs). For a concise summary on what these are, visit VCDHelp.com or read the manual that accompanies each release of VCDImager. At present, GNU VCDImager with its powerful XML scripting system, represents one of the best S/VCD authoring tools available and is the only open source tool. The only thing missing is a comprehensive GUI editor, though a number of third party GUIs are available and constantly in development. This authoring guide series is designed to demonstrate how a variety of complex structures can be authored using VCDImager. It is hoped that this will help fellow VCD enthusiasts. For more discussion and information, I strongly suggest you visit the VCDImager forums at http://forums.vcdimager.org I can be further contacted by e-mail at <vitualis(at)michaeltam.com>, but I strongly suggest you try using the forum first. GNU VCDImager Tools GUI for Win32 (1-Feb-2003) (Version 1.1.207) This program was written as a GUI (graphical user interface) to all the tools in the VCDImager suite of programs (VCDXGEN, VCDXBUILD, VCDXRIP, VCDXMINFO, VCDDEBUG, VCDIMAGER, CDXA2MPEG). It in addition has a GUI for lkVCDxBUILD and lkVCDxRIP. There are now two new tools, the "Subindices Remover" and the "CUE/BIN Regenerator". This is for Windows only. It is open source and licensed under GNU GPL. Structure of the GNU VCDImager XML file (20-Dec-2002) This is a guide which describes in brief and in detail on how the XML system works in context with VCDImager. It covers most of the pertinent tags that you will ever use but is not entirely comprehensive. Read the VCDImager manual for more detailed information. Burning the CUE/BIN image (20-Dec-2002) A quick guide on how to burn the CUE/BIN images. The CD-i application (20-Dec-2002) This is a short guide detailing how to add the CD-i application into your VCD. Simple multitrack VCD (20-Dec-2002) A comprehensive guide that demonstrates in detail how to create the simplest of all VCD structures. MPEG Still images (20-Dec-2002) A guide on the preparation of images for mpeg stills and how they are authored in the XML. Simple Menu (20-Dec-2002) A guide on how to author simple menus. Multi-menu VCD (20-Dec-2002) A guide and representative diagram and XML on the creation of a multi-menu VCD. Chaptering with Entrypoints (20-Dec-2002) A comprehensive guide on how to create chapters using entrypoints and the theory and logic behind it. The Combination Lock (20-Dec-2002) An article on how to author a "combination lock" on a VCD. There are CUE/BIN samples available for download for this guide. In the future... A number of new exciting guides on specific authoring projects are in development... including: the "multi-default menu", the "random" function, an much more. Damn, I need more time... ;-) These guides are half written... I will put them up when I have some free time.